A system of healing that’s been in use for over 2,000 years, acupuncture originated in China. It involves the location and stimulation of certain points along the body, striving for balance on each side. When an imbalance is present, a disease process is affecting our health. By stimulating these precise points, we can increase the flow of energy to that area. Wild Chiropractic offers acupuncture to all patients, with the majority receiving electro-acupuncture. 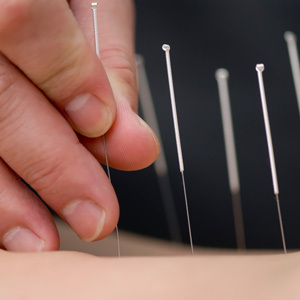 Acupuncture is highly effective for all types of pain, such as knee, shoulder and fibromyalgia. Over 2,000 conditions are recognized to be helped by this treatment, with numerous benefits. It’s used on a broad range of individuals and has remarkable effects. Needles aren’t necessary for you to experience these benefits. We use traditional acupuncture on some patients if they desire it or if more appropriate for their case. Generally, we use an instrument with a certain frequency to stimulate acupuncture points, completed in just seconds. Rest assured that the needles are more like a fine hair, and we use an extremely controlled approach, placing the needle shallowly into the skin. We ask that you wear loose-fitting clothing to your appointment to make it easier to receive acupuncture. There is a small fee for this solution when done in conjunction with your chiropractic adjustment. Contact us today to schedule your appointment! Same-day appointments are available, and walk-ins are welcome.